Human connection is more important now than ever. In this technological age, we’re more connected but disconnected—we literally have the world at our fingertips, but we’re not necessarily happier or healthier as a result. Connecting with community is especially important for women. There are so many pressures on us to be “perfect” and “do it all” that we are often left feeling inadequate and comparing our accomplishments—and how we look, dress, and feel—to those of our peers, which is a recipe for unhappiness. However, when we can put aside our judgments and embrace our differences, we’re also able to support, uplift, and empower one another—in true You.We.All fashion. Spending time with a group of women, whether they’re old or new, can have an incredible effect on your health. Cortisol is our body’s main stress hormone, and it’s released when we’re feeling anxious or overwhelmed. This can happen in both the short-term (like during an argument with your spouse) or the long-term (for example, dealing with a stressful job). This is called our “fight-or-flight” stress response, and for years researchers thought that this was the only stress response mechanism. But new research shows that there’s actually an alternative stress mechanism—that is unique to women—called the “tend and befriend” system. 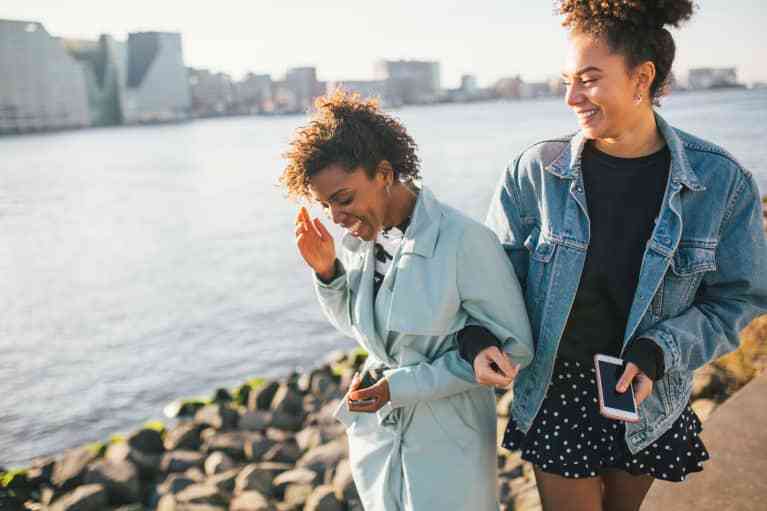 This alternative stress response is triggered when women can exercise their more nurturing side—like when they’re spending time with their children or families, calling up a friend, or gathering in a group of other women they feel connected to. Activities like this stimulate the release of oxytocin, the bonding hormone, which inhibits the release of stress hormones and even helps to calm the nervous system. In other words: Spending time with supportive women can increase stress resilience and soothe your nervous system. Sounds pretty great, doesn’t it? 2. You’ll have an easier time staying motivated. When it comes to eating well and exercising, we all know what to do, but sometimes it can be hard to follow through. But instead of feeling guilty when you can’t get motivated, try calling a friend. Oxytocin, the bonding hormone, also helps to stimulate dopamine, a neurotransmitter that drives our internal reward system and encourages us to learn, explore, and achieve psychological wellness. When it comes to behavior, it’s much easier to make healthier decisions because we want to rather than feeling like we “should,” which is exactly what dopamine helps us to do. 3. You’ll have more compassion for others—and yourself. Something magical happens when women gather—especially those who are going through a similar health journey. It can be easy to get caught up and compare ourselves to others, but the truth is that no one’s perfect, and we all have aspects of our health that we struggle with! That is just one of the many reasons why I designed a six-week program that empowers women to identify the root causes of their health imbalances, while connecting them with women going through a similar experience. We often only think of success as us reaching our goals. But reaching our goals isn’t always a journey that comes in a neat little package. Social media is especially good at glossing over this fact and making us feel “less than” or “not good enough.” We always see the before and after photos, but what does life look like in between? Gathering with our peers reminds us that we’re all on our own health journey. The path from point A to point B isn’t always linear—we eat healthy, we mess up, we get back on the healthy living train. Listening to how others progress and overcome obstacles is incredibly empowering because it reminds us that we, too, can achieve anything we want.